“May we be completely free from all danger, may we be completely free from all grief, may we be completely free from poverty, may we have peace in heart and mind.” - is what a banner reads among hundreds and thoudsands of Buddhist Monks and Nuns in the street of Yangon- the capital of Myanmar, who are coming out from pagodas and monastries demanding for justice, freedom and peace. 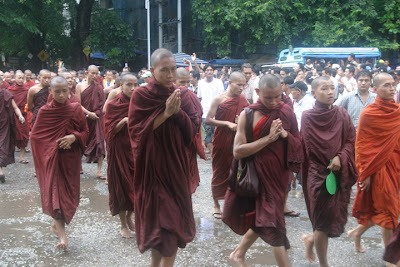 "They are extraordinary images: thousands of monks and nuns marching for democracy on the streets of Burma's cities. The shaved heads, the naked shoulders, the richly coloured cotton robes: all symbols of one of the most ascetic and enduring of monastic traditions in the world. The Buddhist sangha - the collective term for these monks - is the only institutional structure outside government control which has managed to survive four decades of military dictatorship." writes Madeleine Bunting in Guardian. According to report so far 3 monks are shot dead by the government force and hundreds are injured and arrested. Religious and Spiritual moral standpoint has given rise to many changes in human history in terms of revolutionary changes and justice. At present time, the Buddhist Monks and Nuns of Myanmar is observing their resolute non-violent and peaceful protest against the undemocratic military junta government of Myanmar. Revered for self-sacrifice, Buddhist monks in Burma are standing up to the guns of a selfish regime. But these holy men in saffron robes are serving more than a people's desire for freedom. The protests also serve as a reminder of religion's historic role in shaping the kind of moral concern for others that is the root of democracy. Events in Burma are a model, repeated throughout history, of religious movements helping overthrow colonial powers and dictators. Protestant clergy helped spark the American Revolution, with one British commander complaining that "sedition flows copiously from the pulpits. The Vatican II changes of the Roman Catholic Church in the 1960s helped followers in many countries stand up to tyranny. Catholic nuns and priests were on the front line of a "people power" revolution in the Philippines that overthrew a dictator in 1986. Pope John Paul II helped his native Poland lead the way to free Eastern Europe of communism. Soviet dissidents were spiritually nurtured by a few Russian Orthodox priests, helping bring about the 1991 collapse of the Soviet Union. In Indonesia, a 30-million-strong Islamic group called Nahdlatul Ulama gave moral support for the 1998 overthrow of dictator Suharto. Myanmar (also known as Burma) is one of the poorest countries in Asia and has one of the world’s worst religious freedom records. Myanmar’s entire population is composed of 89 percent Buddhist and there are minority Muslims and Christian populations as well. Myanmar has been under military dictatorship almost continuously since 1962, but the origins of its current crisis can be traced back to a failed revolt in 1988. My heart goes out in solidarity for spiritual brothers and sisters in their sacred saffron and pale pink robes. May we all join to pray for peace in Myanmar and may the peaceful, fearless protests bring its intended fruits to the people. My heart fell to my feet today. These peaceful demonstrating monks were only marching unarmed in the name of humanity. These blessed monks stand to gain nothing in this action, because they are all unattached to anything worldly and therefore have nothing to gain personally. When will the huge egos of politicians let go of their personal ambitions and power mongering? I can't believe the military raided the monasteries, beat, and take other monks prisoners! We must keep these blessed souls in our prayers, for they are complying with their missions here on earth. These different forms of modern day Hitler's won't overcome "spirtuality" which is inborn in each soul's heart. Can events in Burma help challenge the generalisation that religious belief can never play a positive role in politics? May love, compassion and peace win over all. May peace be upon all who hunger for peace.